Publishing art monographs is financially challenging, for the author and for the publisher. To obtain an image of a work of art suitable for reproduction, the author usually has to pay a permission fee to the owner of the work—a museum, say—even if the work itself is in the public domain. An author might shell out tens of thousands of dollars for such fees. Costs are high for the publisher as well, what with color illustrations, coated paper stock, and the durable binding needed for a hefty, oversized book. 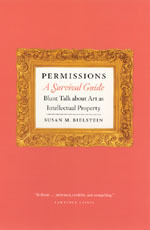 These issues of art and copyright are the subject of Bielstein’s recently-published book, Permissions, A Survival Guide: Blunt Talk about Art as Intellectual Property, an invaluable compendium of insight and advice for authors and others working in the visual arts. Read an excerpt from the book.